Step Right In, Welcome to my Jet aircraft Hangar, Make yourself at Home! Please Scroll down, you might miss something if you don't! CHECK OUT THE BACK CORNER OF THE HANGAR.......................... You never know what you might find there!!! On this site, I am consolidating all the information I can on RC Jet Aircraft. From Turbine Manufacturers, Jet Kit companys to all the nuts and bolts it takes to put one of these puppies in the air! Plus a few surprises in the "Corners of the Hangar"
Check back often as new stuff is added all the time! I'll give a bit of background on how I got involved in RC Jets. Some building instructions, as well as any tips or tricks I've acquired through the years. And, of course, lots of pictures of my past and present JETS and of me enjoying myself working on 'em. Please sign my LOGBOOK and let me know what you think. 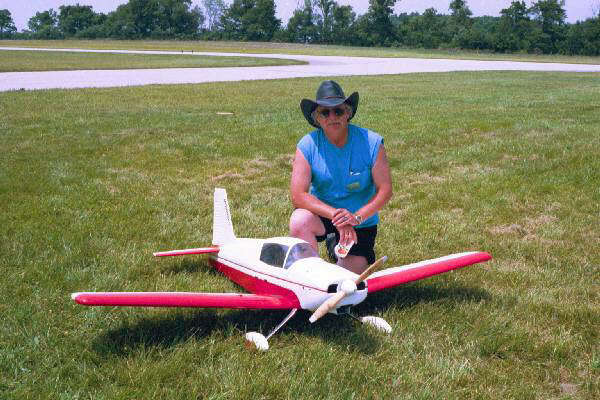 I have been building model airplanes since I was a wee tyke living on a farm in northern Indiana. (Albion) I started with Ukie's made out of cardboard 'cause I didn't have the cash for balsa! Started RC in 1972, and have been flying DF jets since 1976. I flew the RC version, but most of the time the TD .049 would quit after the Bungee Launch! It would go up I'd do a Split Ess then land down wind. Only got about 5 or 6 flights with the engine running. I have a .020 Cox TD powered F-16 in 1/25 scale. It was the world's smallest RC DF in 1986. It weighs 9 oz, and has ailerons and full flying stabs. A couple of byron MiG 15's in there also. when I built three of the origional MIG-29's. Two for TGA and one for me! I painted all three in the Ukraine air show paint scheme. and the F-15 Ultra Eagle III Dynamax and the F-15 Ultra Eagle III Turbine versions of Steve Gray's design. I have been a Topgun Rep, Flying and working trade shows with Steve, for five years. 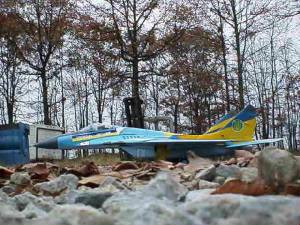 My Topgun Aircraft Ultra Eagle III.